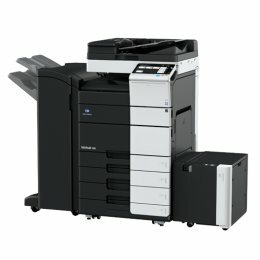 Enjoy fast print speeds of 30 ppm on this black and white Konica Minolta 308 Copier. The Bizhub 308 has a maximum monthly volume of 100,000 pages. The Konica 308 features optional dual scanning of 160 opm and has a maximum paper capacity of 6,650 sheets.